A switch problem at Park St is forcing all outbound Green Line trains to use track 2, with expected delays of 10-15 minutes. "Maintenance activity" Wonder what they're working on, eh? Installing a new piece of plywood? Crossovers are not the issue actually, as there are such near Harvard, Kendall, Park, Broadway, and I think JFK . The issue is actually with the power sections. You might think it's stupid for a power section to run from Harvard all the way to Columbia Jct., which it would be. Since there is no gap between power sections, an overshooting train could bridge the gap from one section to the other potentially livening the dead section. Anyone working on or about the third rail would then be in severe danger of electric shock. To prevent this, when a power section needs to be opened (shut off), the neighboring power sections must be opened as well. This way if a train goes to far, the power section accidentally livened is not one which is being worked on. This is why the outages relating to power sections usually have such an impact. They originally bused from Harvard to Broadway, but then they changed it to Kendall to Broadway. It would look to be easy to use the "two rooms and a bath" approach to breaking up the third rail route into sections. At each section break would be a short (7 carlength) section that is normally connected only to the main section continuing on in one direction. Under normal operation there would be dead spots less than a car length on each side of the short section. But if a main section had to be killed then the short section would be manually disconnected also, and an overshooting train then can't bridge the two main sections. Additional medium length sectionalizing could be done so crossovers can be used from either direction depending on where the trouble on the line is located. How many cars of a 6 car train need power for the train to move when empty? Perhaps the Park St. crossover could be set up to short turn trains when the Longfellow Bridge has a problem, where part of the train loses power when clearing the crossover after leaving Park St.
Last edited by Disney Guy on Thu Mar 31, 2011 6:41 pm, edited 1 time in total. That can't work. As each car hits the dead section, it will bridge it briefly and energize the dead section. That sort of defeats your idea. "WEB CLEAR - Green Line: Due to a switch problem at Park Street, please expect outbound delays of 10-15 minutes on all lines between 400pm-7:00pm. Customers desiring service to/from North Station and Haymarket are encouraged to utilize the Orange Line. Maintenance activity on this switch is expected to last through the conclusion of service. Please allow extra time for your commute. 3/31/2011 3:05 PM"
Disney Guy wrote: That can't work. As each car hits the dead section, it will bridge it briefly and energize the dead section. That sort of defeats your idea. That's right John but his other idea of 7 car train long gaps between sections would work. If either of the sections adjacent to the "buffer zone" section are open, the "buffer zone" section gets opened as well. It would take a lot to set it up, and may be a pain in practice, but its impact on service during emergencies would be spectacular. I suspect the green line work is to prevent a recurrence of the other day's significant delays. I guess they weren't able to fix the switch at Park Street last night. Depending on which one it is, I can't imagine they're able to do much work on it during service hours. And I received a text but do not see an alert on the website for a disabled train at Tufts Med Center. "Blue Line due to a disabled train and power problems at Government Station shuttle buses will replace train service from Government Center Station to Maverick Station. 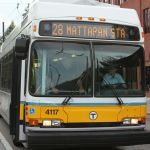 Bus service is unable to stop at Bowdoin, Aquarium, or State Street Stations. Please allow 30-35 minutes to your commute. 4/4/2011 3:49 PM"
"From: talerts@talerts.com (All Bus Routes Alert) All Bus Routes experiencing 20-25 min delays due to Blue Line disabled train and power problems at Government Center Station 4/4/2011 5:22 PM Apr 4 5:23 pm"
So they've given up even busing service during emergencies now? Wire is down, let them fend for themselves. I also like how they're too uninterested in their own operation to select which routes are effected by the blue line. I'm sure the CT2 was all screwed up (sigh). I am not sure how long this has been going on. A few months ago my sister had her car in the shop. She had to take the 112 for 3 weeks. During that time there were two blue line failures and one orange line around 5 pm. She had the tracker app on her phone and would track the usual bus and then watch it disappear. We finally figured out that they were being pulled to start the shuttles. Tonight mess, i was able to hop on a 120 and the driver was screaming that this was not his route and that he was forced off his normal route to cover it. Has this always been the case in unplanned busitutions? Or am I dense and only became aware.